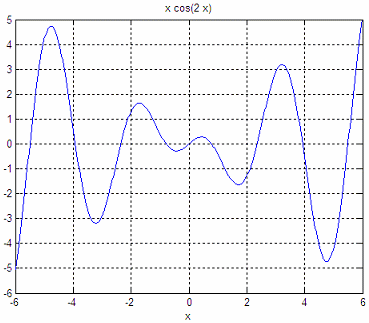 Matlab includes at least two standard functions intended for numerical or mathematical optimization. These instructions are ‘fminbnd’ (for one single variable) and ‘fminsearch’ (for one or more variables). Built-in function ‘fminbnd’ tries to find a minimum of a function of one variable within a fixed interval. 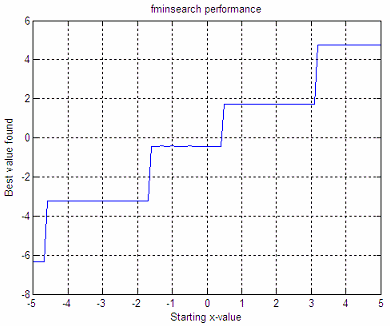 Built-in function ‘fminsearch’ finds the minimum of a scalar function of several variables, starting at an initial estimate. This can be also considered as unconstrained nonlinear optimization. Both functions obtain a local minimum, not a global one. Since we can explore and express a function in terms of a predefined error, minimizing this error function equals optimizing the function. Matlab displays the following answer. We get the number of times that the function was evaluated, the point of evaluation and the function value at each iterate. The value xc = -3.2187 is the best value found after our mathematical optimization. If we change the ‘TolX’ parameter of the options included in the optimization function (fminbnd), we get a different amount of function evaluations and, naturally, a slightly different minimum value. We must be aware that changes in tolerances naturally affect our results. These graphics say that if we start with x = -3, the minimum found after our mathematical optimization is y = -3.22, it takes 6 iterations to reach that value, and 12 function evaluations are needed to reach that minimum. If we start with x = 4, the minimum found is 4.8, it takes 9 iterations, and 18 function evaluations to reach that minimum. We must be very aware that different initial conditions and tolerances lead us to different results. Mathematical optimization is not straigthforward most of the times.